Back to the video game characters here. Regular readers will know I am a big Assassin’s Creed fan. Now I have finally traded in my XBox 360 and won’t be able to play again as this character, I want to tell you why Ezio is my favourite AC protagonist. Appeared in: Assassin’s Creed II, Assassin’s Creed Brotherhood, Assassin’s Creed Revelations (games). The Last Days of Ezio Auditore (web film). To say that nothing is true is to realise that the foundations of society are fragile and that we must the shepherds of our own civilization. To say that everything is permitted is to understand that we are the architects of our actions and that we must live with our consequences, whether glorious or tragic. General character: He starts off rather as a bit of a stereotype – a young, handsome Italian man of a rich noble family, living in Renaissance Italy. He gets into all sorts of minor scrapes and sometimes serenades the wrong young lady. That all changes and he is forced to grow up quickly when his family are betrayed by a nobleman that the Auditore family thought they could trust. He soon finds he is the heir to a rich heritage – the assassins have been silent for centuries and have lost a lot of ground to the Templars and for Ezio, refounding the Brotherhood and leading it in defiance of the corrupt Order will be the making of him. He takes the world on his shoulders, facing off against the Borgias including Rodrigo (Pope Alexander VI) and his son Cesare – both of who were high ranking Templars during their reign of tyranny within the game’s version of history. Complexities of the Character: We watch him grow threefold and it’s hard to believe that the wannabe Casanova at the start of Assassin’s Creed II becomes the figurehead of the Assassin Brotherhood, much less than dark and haunted figure he has become by Revelations in his determination to uncover the truth, preserve freedom and beat back the constant malevolent threat that the Templars present. Ezio has lost so much – the woman he loves, his family, his friends – so many people have died at the hands of the Templars, yet he forges ever on. Rodrigo Borgia: You can’t. You can’t! This is my destiny. MINE! I am the prophet! Ezio Auditore da Firenze: You never were. Rodrigo Borgia: Get it over with then. Ezio Auditore da Firenze: No. Killing you won’t bring my family back. I’m done. Nulla è reale, tutto è lecito. Requiescat in pace. 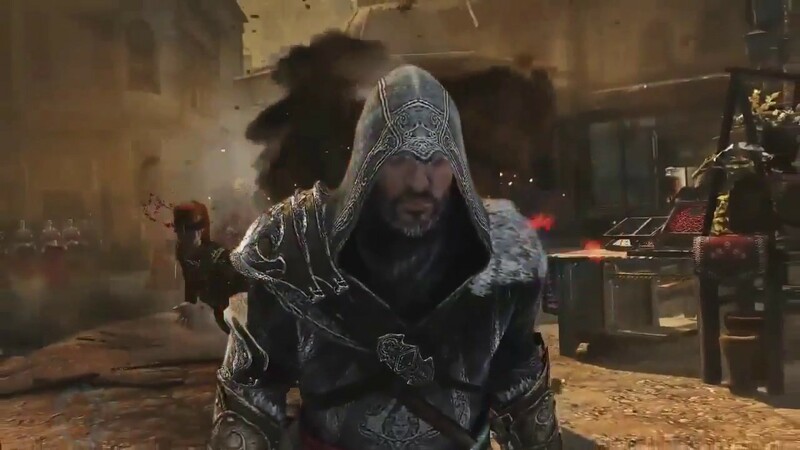 And he is determined – despite allowing Rodrigo Borgia to live at the end of ACII and knowing that all hope was nearly lost with the Templar stranglehold on Rome, Ezio follows the Pope there. The city is in the grip of the Templars and at first his mission to find more Pieces of Eden seems hopeless; Rodrigo and Cesare seem unstoppable. Later on, he is looking for keys to the past of the order and to find out about the mysterious Altair with whom he feels such a strong connection – a connection that was presented to him by the Ancients. In this, he sees the far future too and makes a connection with Desmond Miles a descendant who lives in our time. All this despite knowing that everything he believed about the ancient world and where we came from is wrong. He has seen our past and our future – that sort of knowledge would haunt anyone yet he is driven and never loses the sense of who he is, maintaining himself and not going to pieces over the knowledge he acquires. Rodrigo Borgia: You know nothing, boy. You take your image of the creators from an ancient book – a book, mind you, written by men. Ezio Auditore da Firenze: You are the Pope! And yet you dismiss the central text of your Faith? Rodrigo Borgia: Are you so naïve? I became Pope because it gave me access. It gave me power! Do you think I believe a single god-damned word of that ridiculous book? It’s all lies and superstition. Just like every other religious tract written over the past ten thousand years. I am a tactless minstrel, I sing off-key for coins. If you spot me in the street, please kick me in the loins. Young Cesare, I heard him say, could not be killed by man. So I tossed him through the air to see where he might land. Before Rodrigo was the pope he was a man of vices, and one he gained the holy seed he raised his vices prices. Fair Lucrezia could not sate her appetite for lovers, but I suspect she would be fine, with two or three more brothers! He also doesn’t lose his love of women. 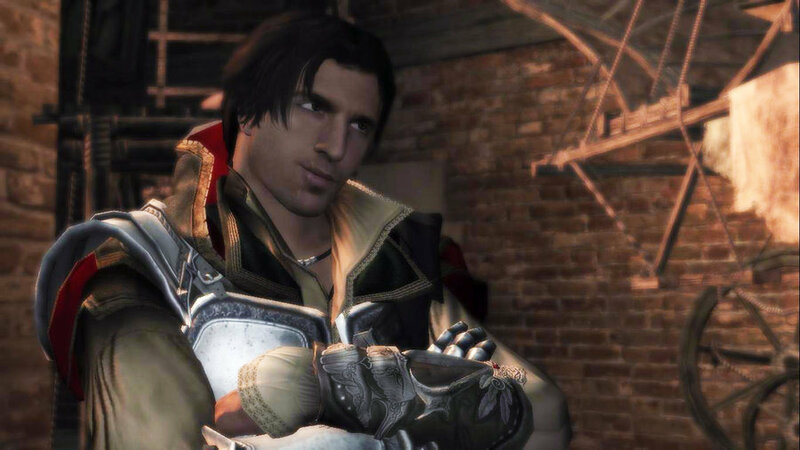 Though he remains a hopeless flirt in older age, there is nothing creepy about it – it’s quite playful and good to see shadows of the Ezio we knew long before he became Master Assassin of the Italian Brotherhood. For many people, Ezio is what really made Assassin’s Creed. We had a great protagonist in Altair, but his cold nature wasn’t appealing to everyone. Ezio in contrast is always sympathetic, a good man, decent and righteous without being boring – exactly what we want in a hero. And unusually, he had no flaws which can often lead to viewer/reader apathy. makes me want to play the game. is that only available on the xbox? Hey NE, good to hear from you! No, the series is also available on PS3, and the newer games on PS4. I’d recommend playing them as the story is so wonderfully rich, especially for sci-fi nerds like us. I would recommend starting with the first game AC1, even though the gameplay isn’t that great, it sets up several major twists and the foundation of the whole series. Besides, you get to run around in medieval Damascus, Jerusalem and Acre which was enough for me 🙂 The Ezio trilogy will certainly hook you though. I loved AC1, with the deep plot and loved the character Altair. The game play got better (except that stupid ship combat, yuk) through series, but the story suffered, in my opinion, in the end I didn’t care about the characters, or plot, and stopped playing. Shame really as the earlier games were great. Connor has about as much personality as Gale Hawthorn (Hunger Games) – as in, not much. I couldn’t stand him. Haytham on the other hand was much more intriguing – but of course he fought on the wrong side. You missed a real treat with Black Flag though, it’s my favourite in the series so far. I’m not surprised you gave up if you felt the ship combat wasn’t very good – it could have been better but I do feel it was vastly improved for Black Flag which is more about ship combat than anything else. Not without its flaws, it has a loveable rogue protagonist in Edward Kenway. I do not have high hopes for Unity as most reviews point to it as being bland, but I have much higher hopes for Syndicate which is out at the end of the year. I couldn’t bring myself to invest in black flag… i never made it through 4. I can sympathise with that. I’ve enjoyed the sea outings (I bought Rogue out of curiosity a few weeks ago and finished it the night before my XB1 arrived), but I think it’s time to lay it to rest – not sure how much more distance it would have had anyway.